KEY FEATURES: An upright shrub/herb to 2m. Confusible with C. annuum. Double check. Fruit usually bright red, rarely purple or yellow. Usually 2-4 pedicels per node. GENERAL NOTE: Mexican native name Chilli gave rise to Spanish Chili and Chile, which are used in American English; and Chilli of British English. In former times it was often misinterpreted as the "pepper of Chile", although it came from Central America and nothern South America. The hot chemical in hot-peppers (Capsicum frutescens, Capsicum chinense, Capsicum annuum and others) is capsaicin (cap-SAY-sin), which causes a burning sensation in mammals. 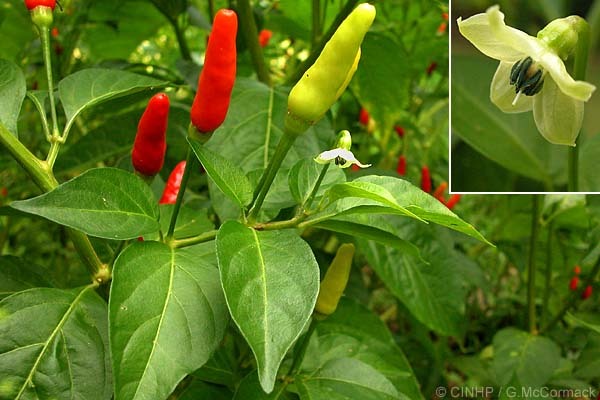 The capsaicin is not digested and it thereby causes a further burning sensation when it is passed several hours later. Birds are immune to the burning sensation and being attracted to the red fruits they are the main dispersal agents. The hottest chilli, the habanero, comes from Capsicum chinense, which is a native of the Amazon in South America. The amount of heat is expressed in Scoville Heat Units (SHUs). Bell peppers have a value of zero because they are homozygous recessive and lack the dominant gene for capsaicin production. Jalapenos and cayenne varieties may vary from 3,500 to 35,000 SHUs, and ripe tabasco peppers flame in at 50,000 SHUs. With values of 200,000 to 300,000, habanero peppers can be absolutely excruciating. A heavy duty pepper spray unit (resembling a small fire extinguisher) sold for grizzly bear protection has a SHU rating of two million.